Three Good Men Talk About Race Powerful perspectives from a senator, a surgeon and a police chief. The best question from a journalist for the man and woman running for president is this: In the area of race relations, why can’t we get it right? All your life, Mr. Trump, all your life, Mrs. Clinton, we have been trying to solve what divides America. Why can’t we? Don’t do that. Give them time. In that time they will be forced to think aloud. If they change the subject, that will say worlds. If they don’t have thoughts to share that will tell us a lot too. Beyond that, even though everyone on media asks for a conversation about race, most of them don’t really mean it. They don’t want a conversation but a platform. They want to talk and for you to listen. And they want what’s said to be circumscribed—they want narrow barriers put on acceptable limits of thought and experience. So people turn away and everyone simmers. You don’t know what it is to be a black man. You don’t know what you’re asking of the police. And, I’m trying to process everything in my heart. Tim Scott, 50, the first African-American U.S. senator from South Carolina, spoke on the floor of the Senate about what it is to be him, and black. That night he got a call from the officer’s supervisor, apologizing. Sen. Scott said it was the third such call he’d received since he entered the Senate in 2013. Another good man was at Parkland Memorial Hospital last week when victims of the Dallas shooter came in. Brian Williams, 47, was one of the trauma surgeons. “This experience has been very personal for me and a turning point in my life,” Dr. Williams, who is black, told the press. They’re used to multiple gunshot victims at Parkland, “but the preceding days of more black men dying at the hands of police officers affected me. I think the reasons are obvious. I fit that demographic.” He too has been stopped by police over the years, once thrown “spread eagle” on the hood of a cruiser. “But I abhor what has been done to these officers,” Dr. Williams said. He worked frantically to save them. Then he grieved. So he walked forward and joined the line. Answering a question, he told a great and immediate truth: “We’re asking cops to do too much in this country.” They’re paying the price for every societal failure. “Not enough mental health funding? ‘Let the cop handle it.’ Not enough drug addiction funding? ‘Let’s give it to the cops.’ Here in Dallas we’ve got a loose dog problem. 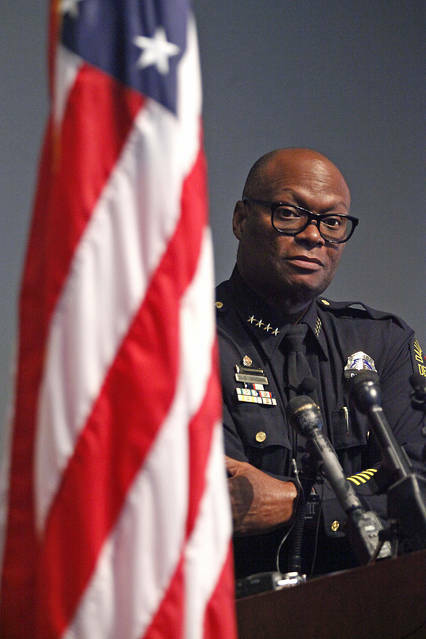 ‘Let’s have the cops chase loose dogs.’ Schools fail, ‘Give it to the cops.’ Seventy percent of the African-American community is being raised by single women—‘Let’s give it to the cops to solve that is well.’ ” Society, Chief Brown said, has to step up. David Brown has become an American folk hero. Who wasn’t grateful he was there? I thought of it all this week. These great men, 20 years ago, were young. I must have passed them on the street. All three this week helped save our country.